Find out why experts believe that uniformity is more important than on-target rate in targeted next-generation sequencing, in this White Paper. With Twist Bioscience's Exome and Custom NGS Target Enrichment Solutions, lower your sequencing costs along the way. Get the White Paper to learn more. Twist Human Core Exome is designed to target highly conserved consensus coding regions in the human genome. Providing superior uniformity, this exome delivers improved coverage of targets with less sequencing costs. 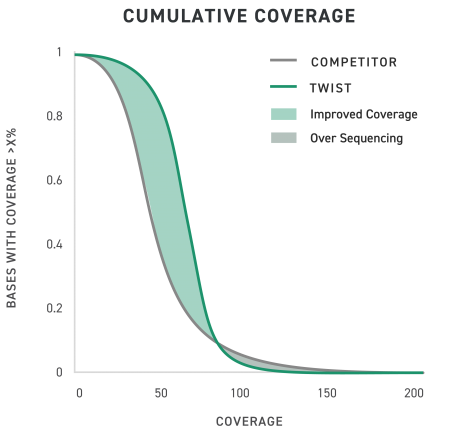 Twist Bioscience’s probes enable improved coverage of intended targets when compared to competition. Improved uniformity increases the percentage of bases covered at the desired depth and reduces the amount of over sequencing.